Two identical cabins nestled a short walk from the Lodge. 2 person jacuzzi & shower, river rock fireplace, private deck overlooking MHL’s 20 acre meadow with the Cascades as the back drop. Both cabins are designed for two people. The Lodge has 10 private accommodations. A suite, and 9 rooms facing either the Cascades or the surrounding forest. All accommodations are for two people. No Distractions…Just your group and mother nature surrounding MHL on its 20 acre meadow. Complimentary gourmet breakfast & nightly wine and appetizers all served to your private table. Dietary concerns are welcomed. 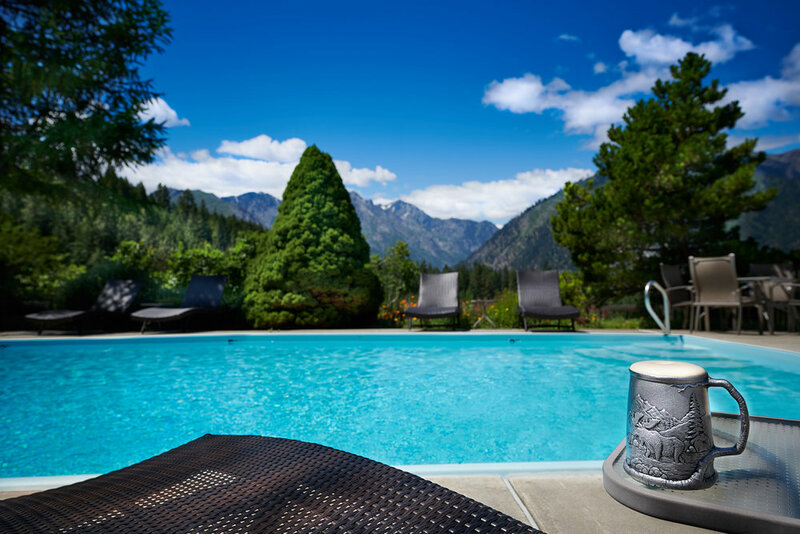 MHL…Voted #1 Setting in the West and just 3 miles from downtown Leavenworth. With local rafting, wineries, spa, shopping, theater, etc. MHL is the ideal private venue for hosting your reunion. Mountain Home Lodge offers a secluded escape from the demands of our busy lives. Nestled in its own alpine meadow overlooking the majestic WA Cascades and surrounded by nature, this private luxurious 12-guest room resort offers romance, renewal and serenity.